Where Am I in the Pecking Order? As central Florida begins to settle into a summer pattern, I thought it would be a good weekend to stay more local and see what was happening both at the Helen and Alan Cruickshank and Turkey Creek Sanctuaries this past Sunday. As expected, it was a quiet morning at both places, but it is breeding season for most of the resident birds. That means fledglings! There were at least a couple of Purple Martin families flying high above the Cruickshank Sanctuary, with many of the fledged birds taking food from adults while on the wing. Purple Martin calls can sometimes sound almost like a Star Wars blaster effect or a metallic twang, and these sounds filled the air for the whole time I was there. 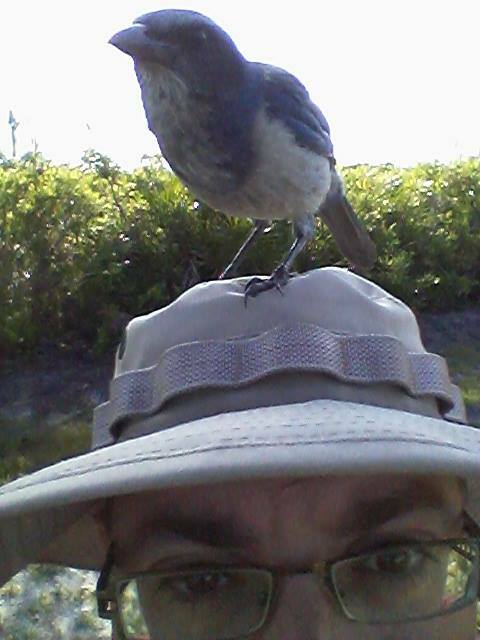 Also fledging are the Florida Scrub Jay chicks. Almost immediately upon stepping into the sanctuary, I had inquisitive youngsters fly up to take a close look at me. 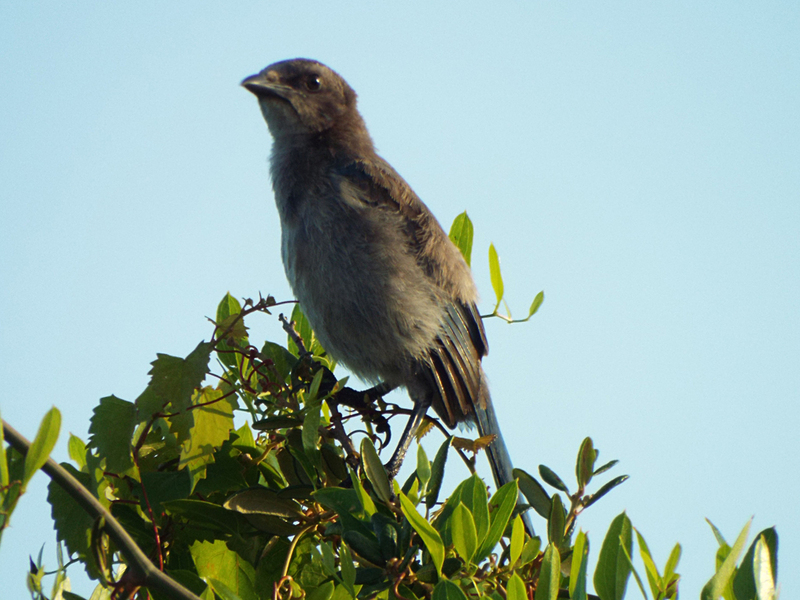 This immature Florida Scrub Jay is a little older than a fledgling, but is yet to molt into his adult plumage. 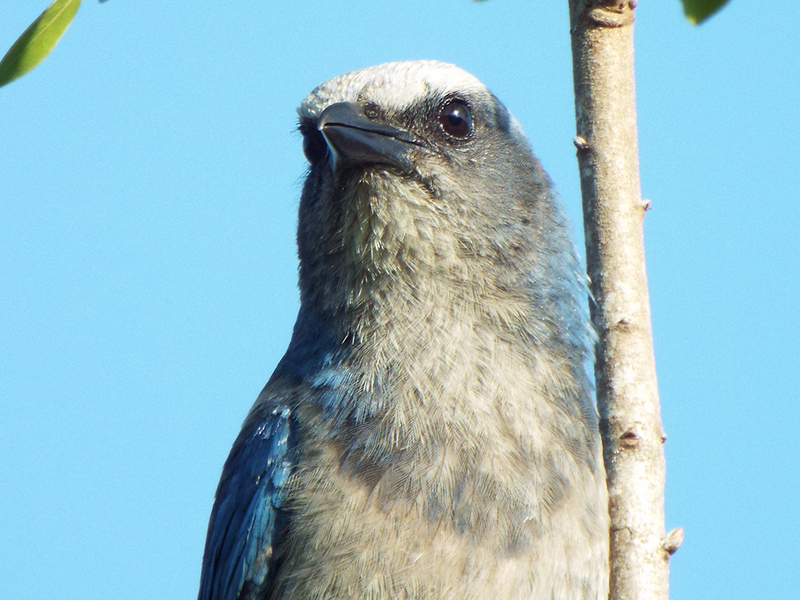 An adult Florida Scrub Jay acting as a lookout. At one point an adult landed on my head. This isn’t unusual at this sanctuary. In the past, scientists and hikers alike fed these birds peanuts, which took advantage of this species bold and gregarious tendencies. It was found that in the long run this was not helpful for the long-term rehabilitation of the species (especially if the birds were ever relocated to colonize new habitats in the future), so the practice was officially discontinued. Unfortunately, many visitors continue to feed these birds, and some of them have come to expect the hand-out. In the case of this particular bird, it began pecking me on the head! This bird pecked at the phone right after this shot. 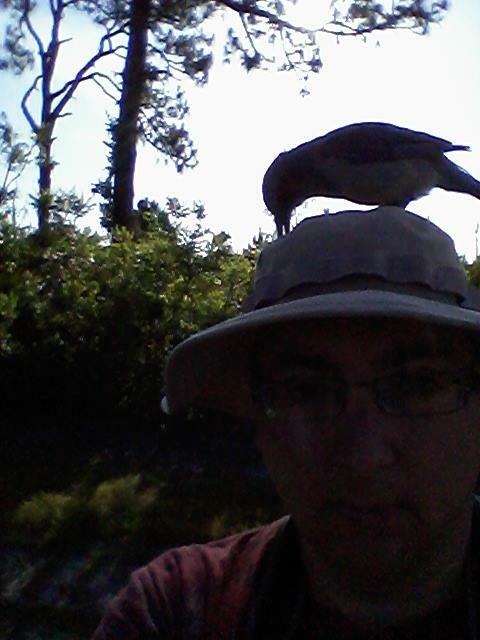 After I pulled my hat back far enough to get the bird off of me, it landed on the ground and then looked up at me, confused, as if it had done nothing wrong. 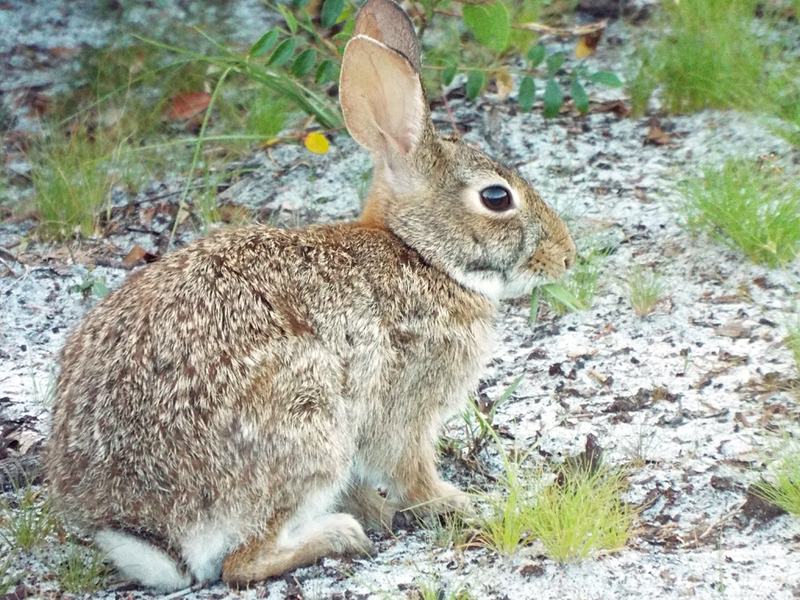 There were some non-avian friends about the place, too, including a nice collection of Eastern Cottontails, some Green Anoles and other lizards, and frogs, singing in the trees. 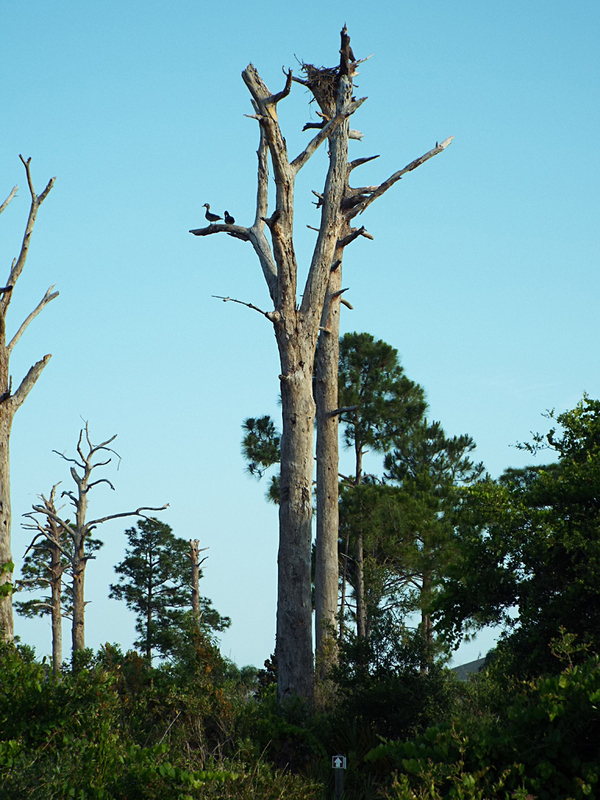 A pair of Wood Ducks were sitting up in some of the dead trees. I suspect they may have a nest nearby, though they either already had a brood of chicks or the female has yet to lay eggs (or it may be both; Wood Ducks may have 2 broods per season). Wood Ducks nest in cavities that may be over 50 feet off the ground! When the young hatch, they jump to the ground just a day or so later, surviving a harrowing fall and running off to join their mother, usually to the relative safety of a pond or stream. 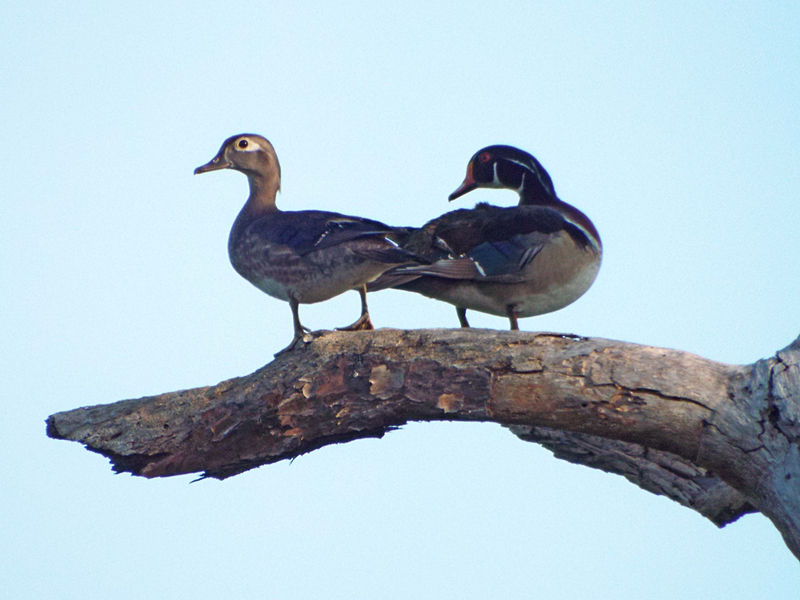 A Wood Duck pair, high above. The nest up and to their right is an Osprey aerie. Overall, it was a pleasant morning and I left this sanctuary before the heat of the day. You can see the complete list of birds I identified below. I then drove south to the Turkey Creek Sanctuary to get a look at how it was faring, post-migration. It was relatively quiet, though the woods were full of Carolina Wrens and Northern Cardinals singing and calling. It started to get a little warm as the day progressed, but there was a reasonable amount of bird activity spread throughout the portions of the sanctuary I visited (I did not walk most of the boardwalk). Many Northern Parula chicks have fledged, and were begging for food high in the canopy as their parents gleaned food for them, and at the weir there were some first year Common Gallinules and one transitioning Little Blue Heron. This immature Little Blue Heron has gotten most of its adult primary feathers. The biggest surprise was a Gray Catbird out by the turn-around by the boat ramp and end of the jogging trail. It’s not the first time I’ve seen one in the area in the summer, but it is unusual. I may have heard a second one, but I can’t be certain. That’s one of many reasons to love birding: you never know what to expect and surprises are always possible. Posted on 2016 May 31 by Lonely BirderPosted in BirdingTagged Birding, birds, birdwatching, Helen and Allan Cruickshank Sanctuary, Turkey Creek Sanctuary.